We’d like to take a more in-depth look at Thermal Paper Sensitivity. Paper Sensitivity is a significant factor when selecting a thermal paper for your application. The sensitivity of a thermal paper refers to the degree to which it reacts to heat (energy). A high sensitivity product will create a better image than a low sensitivity product when given less heat or energy. Images that need to be rich and dark require a high sensitivity thermal paper. Paper Sensitivity is measured on a Dynamic Sensitivity Curve which is an X-Y graph that measure Energy in mill joules vs. Density. A fully developed thermal image will typically be 1.2 density reading or greater. The dynamic sensitivity curve shows how fast a thermal paper will image or print. It is especially important when selecting the thermal printer, since the higher the dynamic sensitivity of the paper, the faster the printer is able to operate. Dynamic sensitivity curves are available for a complete range of thermal papers. Alternatively, images that do not need to be as crisp can be created on low sensitivity products. 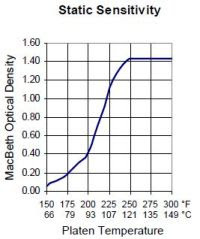 Static Sensitivity curves are important when considering using thermal paper in adverse environmental conditions like high temperature and UV exposure. Lower static sensitive thermal paper is needed to ensure that the media will not image due to heat from the sun or any other external source. There are Top Coated sheets available that can help in extreme instances where you might need to balance generating a good thermal image and not getting any unwanted background development. In general, Paper Sensitivity is a balance of the paper, printer and environment in which they are being used. 80-90% of the applications use a standard grade thermal paper and function well. There are also many thermal printers used in harsh environmental conditions that function very well using special coated thermal products that fit the application. About the author: Prior to founding POS Supply Solutions in 1999, Stephen Enfield was Director of Sales at MICROS, the world's leading developer of enterprise applications serving the hospitality and specialty retail industries. His 10 years at MICROS coupled with his experience at POS Supply Solutions gives Stephen over two decades of experience in the Point of Sale industry, working with large multi-national accounts as well as small business accounts.